A Western Australian artist who creates amazing and mesmerising semi-autobiographical sculptures, Amanda Shelsher’s work is built by hand through a combination of slab and coil techniques so that each finished piece is unique. Amanda’s works have been included in many prestigious competitions and exhibitions within Australia and internationally, and are part of collections such as National Gallery of Australia, Rockhampton Art Gallery, Manly Art Gallery and Museum, La Trobe University. Collectors of her work include Billy Connolly. Resonance – a public art work by Amanda Shelsher now graces the Perth foreshore. 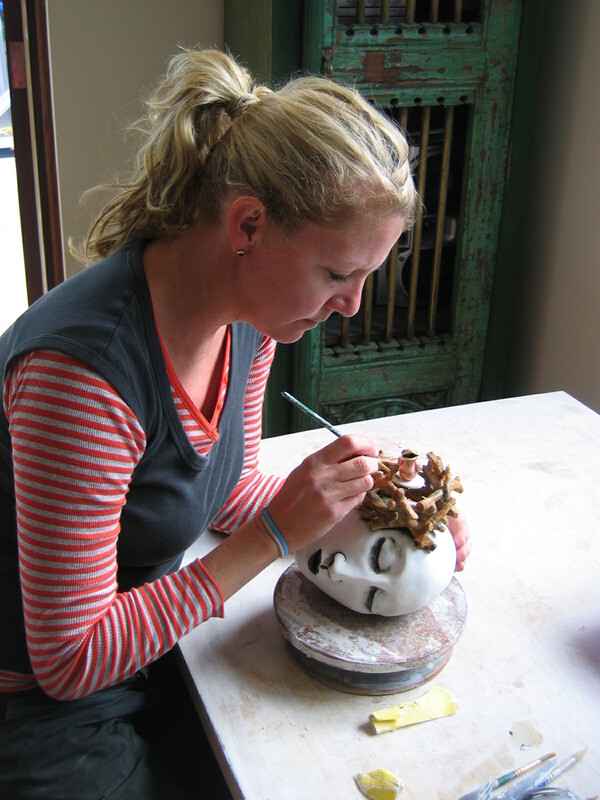 Amanda Shelsher works as a full time sculptural ceramic artist from her home in Perth, Western Australia. She grew up surrounded by bush in the small suburb of Gooseberry Hill and was introduced to clay at the age of 10 when her mother began her own career as a professional potter. 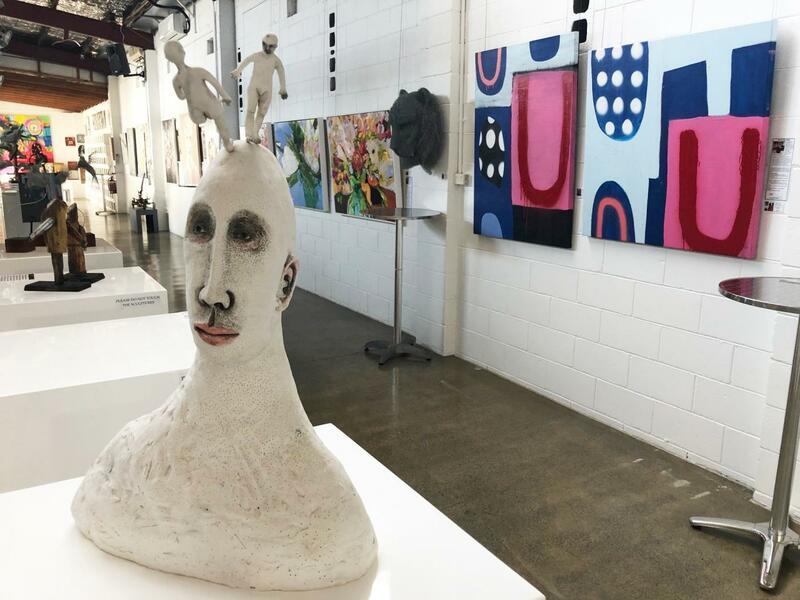 Amanda began exhibiting at age 18 and went on to complete a Bachelor of Arts in Visual Arts – Ceramics at Western Australia’s Curtin University of Technology. She then completed her Graduate Diploma of Education (Art – Secondary) the following year in 1992. Shelsher’s works are built from home, where she sits in the lounge room at her worktable, surrounded by her family. She uses a variety of clays; stoneware, paper clay and porcelain. All of her pieces are built by hand through a combination of slab and coil technique, so that each finished piece is unique. Amanda assembles and models the features of the bodies when the clay pieces are firm; she then later uses the sgraffito technique to ‘draw’ onto the figure’s bodies like a tattoo. This distinctive style requires her to build the body from one type of clay and then paint over the surface using different coloured liquid clay called slip. She then uses a scalpel to scratch through the slip to the clay underneath to create delicate line drawings. Colour is achieved by using oxides, stains, slips and glazes, before firing the pieces to 1200C or 1200C. This ensures her work will last for generations. Her works have been included in prestigious competitions and exhibitions nationally and from Chicago to Los Angeles, London to Hong Kong, Taipei and Korea. Collections include: National Gallery of Australia, Canberra, Gold Coast City Art Gallery, Rockhampton Art gallery, Queensland, La Trobe University, Melbounre, Manly Art Gallery and Museum, Sydney, City of Perth and City of Wanneroo Art Collections, Western Australia, National Australia Bank. 2006 Gallery Assistant, Art Taipei, Hua Shan Culture Park, Taipei TAIWAN. Installed works for Fubon Banking corporation and gallery assistant for Raglan Gallery. 2007 The West Australian Visual Arts “Shining Sprit of Collaboration” June 23rd.